I walked out of the US Capitol on Friday evening just as a torrential downpour started. The sky opened up, and all the humid DC air released its pent-up energy in a big, blustery storm of thunder, lightning, and horizontal rain. It was a fitting conclusion to a very intense and stressful week of working on climate legislation. The entire day was a long and crazy adventure in politics. I started my morning at 8am in a demonstration in front of the White House in anticipation of Angela Merkel's visit with President Obama. 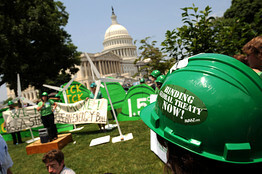 The Avaaz Action Factory had giant green hard hats and cut-outs of the two leaders were there to show the domestic and international press that Americans expect a lot more from both leaders. Read more about that action here, and see the coverage in the Boston Globe. But my day wasn't over. After heading back to my house to read updates on the climate bill and send off some tweets urging DC folks to come to our afternoon rally, I left with our van of props for the Capitol. That rally, organized by the Energy Action Coalition and Chesapeake Climate Action Network and the Avaaz Action Factory had been thrown together in 2 days with news of the upcoming vote with one major goal: insert ourselves into the climate debate as saying, "We want more!" (Photo in WSJ). So by the time I left the Capitol, I had participated in two actions, led a team of young people in green shirts through the Capitol to remind reps of where the youth stand (in favor of a STRONG climate bill) and then sat in the gallery for an hour with 40 youth leaders watching the circus that is Congress. I anxiously watched those votes come up on the basketball-style scoreboard, as the Yea's were at 185, and then 204, and then 209, and then 214, and then 217, 218, and finally 219. And that was it, one of the most powerful assemblies in the world had just voted to reduce emissions in the United States --a truly historic achievement. But I couldn't celebrate at all, because no matter how historic this event was, it is not based on science, it is not a measure that seeks to urgently safeguard the most vulnerable people in this country and this world. And it is not a bill that moves us directly or boldly towards a clean energy economy. I can't reply to most of those questions directly because I'm not proud of the answer. Instead, I have to respond with different lines of argument: this process cannot stall out here, because we would lose years of not doing anything. We didn't have a tidal wave of public opinion calling for a climate bill, but rather left Waxman and Markey to fight for this legislation largely without presidential support or intense grassroots demand. A few weeks ago it became apparent that this bill was not going to get strengthened in the House, and reps were going to be largely left with just a Yes or No vote. At that point, many of us realized we had been naively led into the trap of supporting the bill's sponsors, instead of creating a clear demand for more with the threat of not settling for less. Creating that strong demand should be the work of the grassroots movement, which we didn't create coming into this. I'm thinking about how we can build for the next time around. I walked out of the capitol in a very reflective mood, but over the weekend the path ahead has become much clearer. We need to be clear that we will not settle for anything less than a transformational piece of legislation that reflects the urgency of the crisis we are in, not to mention the opportunity that a very different future provides. Earlier today, Congressman Henry Waxman was asked to directly respond to the Breakthrough Institute's analysis of the American Clean Energy & Security Act (ACES) during an interview on the Montel Williams Across America radio show. His segment came after my interview on the same show, where I highlighted Breakthrough's analysis and spoke about some of our concerns with the bill. Montel Williams: "Teryn Norris from the Breakthrough Institute and several other people say that this [bill] is based on credits that would be given out and traded by companies to meet their carbon footprint - I'm being told that 85% of these are being given away when they could have been auctioned off, which would have been a revenue source that could have been put toward more forms of renewable energy. Why did we decide to give away these credits rather than auction them off?" Congressman Waxman: "We're giving away the credits to utilities in order to protect ratepayers. The credits they won't have to pay for won't be charged to ratepayers, both individual consumers and businesses... So this is a way to be fair to the consumers. The essence of the legislation is that we're going to get reductions and we're going to have a limit on carbon emissions and those limits go down. As we try to squeeze down the amount of carbon year after year we want it done in a way that hurts the consumers as little as possible and we think for the most part we've protected most people. And we want it done in a way that can produce the result in the least expensive way, so there are offsets that can be purchased. It doesn't make a difference that a coal-burning powerplant has to reduce its emissions if they have to do it by reducing their own coal, that could be more costly than just buying an offset and we still get the same environmental result. The environmental result is achieved, we do it in a way that would impact the economy in the easiest manner, and at the same time we're providing renewable fuels and greater efficiency and opportunities to get cars on the road that will pollute less. It's going to transform our economy and in the whole process it's going to produce I think millions of new jobs, it's going to unleash investments that could be as much of an incentive and stimulus to our economy as anything the government could do, it's going to do more than the stimulus we passed because the investments are going to be made in the private sector." Stay tuned for an upcoming post where Breakthrough Institute will address Rep. Waxman's points. To begin, however, it is worth noting that Rep. Waxman asserts that freely distributing carbon allowances produces the same environmental result as full auctioning and is specifically designed to protect ratepayers. Why, then, did President Obama and his Budget Director recently state the following about the importance of auctioning allowances? Peter Orszag: "If you didn't auction the permit, it would represent the largest corporate welfare program that has ever been enacted in the history of the United States. In particular, all of the evidence suggests that what would occur is the corporate profits would increase by approximately the value of the permit." President Obama: "If you're giving away carbon permits for free, then basically you're not really pricing the thing and it doesn't work -- or people can game the system in so many ways that it's not creating the incentive structures that we're looking for"
Jenkins on KPFA: Is the Climate Change Bill in Danger of Being Ineffective? Last Wednesday, June 23rd, I was a guest on KPFA radio's Morning Show to discuss the shape of the Waxman-Markey American Clean Energy and Security Act. Two days later, the 1,300 page climate and energy legislation passed the U.S. House of Representatives by a vote of 219-212 on Friday evening. Leading energy experts from across the country sent a letter to President Obama and members of Congress on Thursday calling for a massive increase in clean energy investments included in the American Clean Energy & Security Act. "We express our profound concern about the abysmal funding for energy technology innovation in the Waxman-Markey American Clean Energy and Security (ACES) Act," the energy experts wrote. "As it stands, this Act ignores President Obama's consistent call for investing $150 billion over ten years in energy research and development." Analysis by the Breakthrough Institute has shown that ACES invests only one-fifteenth of what President Obama has consistently promised for energy R&D. As Michael Shellenberger and Ted Nordhaus wrote today, "While the White House web site still promises $15 billion annually for clean energy R&D alone, the House climate legislation would invest just $800 million to 1.4 billion in R&D." The energy experts called for a clean energy RD&D budget of $20-30 billion annually. "Moreover, we believe that at least $30 billion will be needed annually to research, develop, and demonstrate low- and no-carbon energy technologies, with the aim of achieving breakthroughs that can make them much cheaper." This letter echoes the recommendations of the Brookings Institution, International Energy Agency, Apollo Alliance, Breakthrough Institute, and others. In late 2007, 30 energy experts including several Nobel Laureates wrote a letter to Congress calling for $30 billion of annual investments in clean energy RD&D. We express our profound concern about the abysmal funding for energy technology innovation in the Waxman-Markey American Clean Energy and Security (ACES) Act. As it stands, this Act ignores President Obama's consistent call for investing $150 billion over ten years in energy research and development. Moreover, we believe that at least $30 billion will be needed annually to research, develop, and demonstrate low- and no-carbon energy technologies, with the aim of achieving breakthroughs that can make them much cheaper. Large public investments in technology innovation have been critical for establishing America's leadership in the aerospace, computer, Internet, and pharmaceutical industries -- and they will be critical to establishing America's leadership in clean energy. Regulations and a price on carbon dioxide -- especially the low price that the Waxman-Markey's ACES bill would establish -- will not be enough to achieve the necessary technological breakthroughs. With a carbon dioxide price of between $10 and $15 per ton, the ACES bill would allocate just $500-$750 million for clean energy research and development (with additional funds directed to commercialization and deployment). In contrast, the bill would allocate $28-$42 billion annually for fossil fuel-reliant energy companies, utilities, and heavy industries. "We have a choice. We can remain the world's leading importer of oil, or we can become the world's leading exporter of clean energy." He continued, "we can hand over the jobs of the future to our competitors, or we can confront what they have already recognized as the great opportunity of our time: the nation that leads the world in creating new sources of clean energy will be the nation that leads the 21st century global economy. That's the nation I want America to be." We are writing to ask you to help realize President Obama's vision for the role of clean energy in a prosperous, safe, and independent America. We urge you to support energy innovation, and work to allocate at least $30 billion per year to research, develop and demonstrate clean energy technologies. Cross-posted from "It's Getting Hot In Here"
While many of my friend in the movement have been in DC and trying to mobilize for, against, or to strengthen the ACES bill t, I've been organizing in Minnesota as part of the Twin Cities Summer of Solutions program - you can read more posts on the programs around the country on solutionaries.net. In my work, I'm continually challenged by the persistent disconnect between the real implications of what we're trying to achieve through bills like ACES, how most people understand it, and the results we get. This morning I wrote a blog post in major metro-wide paper - the Star Tribune - attempting to redefine what ACES means and how we should respond. I'm including it here because I think we really need to get better at saying what we're about and why it is important. As you read, feel free to check out the posts I'm responding to, remember its written for a Minnesota audience, and please share your thoughts on strategies to end the communications gridlock. Article starts below the jump. The American Clean Energy Security Act passed the US House yesterday 219-212. The process has already been long and steady - starting with committee hearings back in February - and there is still a very long way to go - the Senate, conference committee, final passage, so there's no guarantee that anything will get passed. Unfortunately, the provisions of the bill that would go the farthest towards building a solid economic foundation for a sustainable economy that can take America forward have been consistently weakened by those who tend to think of it as a tax, and argue that it will hurt our economy. As a result, the bill that eventually passed has far more incentives for the same old energy sources that have been sucking American wallets dry, and far fewer mechanisms to help build the green economy of the future than Waxman, Markey, and other Democratic authors intended. I understand the fear of additional imposed cost on the American consumer, but the unrelenting conservative attacks on the bill have actually resulted in a bill stripped of most of the mechanisms that would have made it an engine for economic recovery for a 21st century America. * Our overwhelming consumption of material products is the largest market for China's booming manufacturing economy, which is incredibly coal and oil intensive, raising international competition for scarce fossil fuel resources. China and other developing nations are now hosts to most of manufacturing industries that the US has lost over the past several decades. Mass global materials trade is made possible by cheap fossil fuels, meaning that a cheap fossil energy era has made it possible for large industries to leave this country and go overseas while still selling to our apparently insatiable consumer market. This has led to a mass trade deficit, requiring the US to borrow trillions of dollars (much of it from the Chinese) that have weakened our economy further, leaving us vulnerable to the types of threats we are facing now. - you can get most of this from the Economist, though some pieces I've heard put most eloquently in Thomas Friedman's book, Hot Flat and Crowded. * Clean energy investments create 3-10 times more jobs (reports by Berkeley Energy labs, the US Department of Energy, and other sources vary on the exact amounts) per dollar than investments in dirty energy systems like coal, oil, natural gas, and nuclear. This means that taking money out of dirty energy industries and putting it into clean energy industries creates 2-9 jobs for every one lost. True, they aren't necessarily the same skill sets, but ACES and other clean energy bills have tried to use part of the revenues from carbon permits to retrain workers for new clean energy industries - as well as help people from disadvantaged communities enter emerging job markets created by clean energy. * In 2008, for the first time, global private investment in clean energy exceeded global investment in dirty energy. While dirty energy still makes up the majority of our energy economy, renewable energy is growing at 20-40% annually, even in the economic downturn. This is despite the fact that the federal government gives tens of billions of dollars in subsidies to fossil energy each year, while providing very poor incentive for clean energy - though for some reason, anti-pork fiscal conservatives tend to focus wrath on the much smaller incentives provided to clean energy (Boiling Point - Ross Gelbspan). Its also despite the fact that our current energy regulatory system poses massive barriers to access to small, local entrepreneurs who want to start their own energy systems, as community-based wind developers in rural Minnesota know well. * The costs of renewable energy are falling annually - wind energy for example is becoming cost-competitive with coal in many parts of the Midwest. Dirty energy sources like coal, natural gas, and especially natural gas and nuclear are rising due to limited supply, increasing extraction costs, and rising demand. This trend is expected to continue. Meanwhile, as I mentioned in my earlier post about efficiency, we are ignoring hundreds of billions of dollars in annual energy savings - and instead are sending that money overseas to foreign dictators - that could give us a first leg up on a revitalized, resilient economy. Basically, linking efficiency and clean energy while working towards the big-picture structural changes in smart grids, better urban systems, and clean agriculture is a strategy for empowering entrepreneurship and innovation while cutting our energy costs and reducing our vulnerability to foreign oil suppliers and unstable energy prices. Continued reliance on fossil fuels is a bumpy, but one-way ride towards rising prices. - several US Department of Energy sources support these claims. 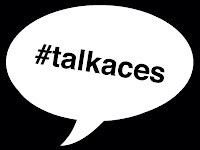 What this all boils down to is that what ACES is actually trying to achieve is investing in a new type of economy. It is trying to move money and private investment away from the dirty energy sources that have been dragging our economy down for the past decade, emptying our personal and federal pocket-books, sending industry overseas, and propping up petroleum dictatorships. Its trying to move that money into new industries, led by scrappy American entrepreneurs who want to create jobs for everyday Americans in new energy industries that will avoid energy waste and generate a new foundation for our economy from clean energy sources that we control. Its trying to break down the old boys club of big energy companies to provide access to innovators who can make clean energy and energy efficiency cheap, and revitalize American manufacturing by creating demand for wind turbines and hybrid-electric vehicles, and efficient houses (new, and upgrades), sustainable, accessible food for all, the transportation infrastructure of the future. Its about taking the huge black hole into which all our energy expenses have gone and turning it around - making it into an agent for investment and innovation in a sustainable economy. Putting a price on carbon-intensive activities like burning coal and oil, and providing incentives for a new universe of clean energy innovation, is just a vehicle towards that end. My concern is by how much the bill has been weakened by pro-industry lobbyists, in ways that will prevent it from achieving this potential, and block everyday Americans from opportunities not only to avoid the costs of carbon emissions, but to profit from reducing them. As the bill was weakened, more and more permits were outright given to polluting energy companies, potentially allowing the types of profiteering and speculation that have resulted from carbon markets where permits to pollute were given away to polluters elsewhere (Europe under the Kyoto protocol is a prime example). The targets for limiting carbon pollution decreased, and provisions for offsets, where energy companies avoid reducing their own use of fossil fuels by reducing pollution elsewhere - often questionable - increased. With a wide range of other changes, the ways in which the bill was weakened mean more benefits to the same old industries that have been subjecting American citizens and companies to the rising costs of a dirty energy economy, while reducing the opportunities for emerging American entrepreneurs. This could mean bigger profits for energy companies doing the same old business as usual (mostly), higher energy costs, AND very little in the way of empowering the next era of American innovation. While I try to avoid cynicism, I sometimes fear that this scenario is exactly what dirty-energy lobbyists on Capitol Hill most want. Not only does the bill give much of its financial benefit directly to polluters, it could also generate public backlash from rising energy prices WITHOUT providing the new wave of economic opportunity that could help take America forward. This could create more public opposition to further action in the future, thus delaying our transition to a clean energy future and protecting the long-term interests they have in coal, nuclear, and oil. I hope that all those out there concerned about our economy and protecting consumers avoid being hoodwinked. ACES is far from over, and we still have opportunities to strengthen the provisions that invest in a revitalized clean energy economy and American entrepreneurship while weakening corporate welfare for foreign oil producers and low-job-creation dirty energy companies. The fight now moves to the Senate - we have just a few more chances to ensure ACES spurs our economic recovery. The American Clean Energy and Security Act of 2009 passed the House of Representatives Friday afternoon, with only one vote to spare. We owe Chairmen Waxman and Markey their fair due for getting this done – molding a bill that reduces US emissions 83% below 2005 levels by 2050 and that 217 other members of the house will actually vote for is impressive. Its passage is groundbreaking. But the bill itself isn’t. As soon as we’re done congratulating Mr. Waxman, Mr. Markey and the other 217 representatives on the “yes” side, we owe it to ourselves and future generations to light a fire under them, the rest of the House, the Senate and President Obama. ACES isn’t good enough. It isn’t smart enough. And gosh darn it, people who fully understand the science and economics of climate and energy don’t like it. But that’s the sorry state of the US Congress today – even with a handsome Democratic majority, legislators are still more concerned with dirty industry’s short-term profits than they are with the long-term feasibility of our modern economy. This bill compromises our economy and our environment for political necessity. To the credit of Chairmen Waxman and Markey, the slim margin of passage tells me they compromised almost exactly as much as was needed to get this done, and not a bit more. The environmental community was anything but united behind this bill. While dirty industry allies like NRDC and Environmental Defense Fund celebrated the bill as the end-all, be-all policy, organizations like 1Sky, Energy Action Coalition and Focus the Nation urged passage of the bill with steep caveats – calling it out for its weaknesses and demanding improvement. To the left organizations like Greenpeace and Congressmen like Peter DeFazio (D-OR) and Dennis Kucinich (D-OH) opposed the bill, protesting its weakness and potential for financial corruption. In order for the passage of this bill to go down in history as a step forward, it must be followed by bigger steps, bolder steps, truly transformational decisions at every level of government and in every sector of society. This won’t be easy. Conventional wisdom says the Senate is a much more conservative body than the House, with the interests of dirty energy and dirty industry even more deeply entrenched. But there are only 100 Senators, and we need support from only 60 of them (thanks to the GOP’s willingness to toss democracy out the window and employ an always-filibuster policy). I am disappointed with the House version of the bill, but it has not shattered my confidence in humanity to the point that I am willing to give up the idea that our movement may be able to show 60 of these powerful individuals the light. And in fact we must either strengthen this bill significantly and pass it in the Senate, or kill the bill. Allow me to repeat: If ACES does not get a whole lot stronger in the Senate, it is time to kill the bill. Kill the bill and start over, or kill the bill and let EPA use its authority to regulate greenhouse gas emissions. Of those options, I strongly prefer the former. So how can we do it? In my humble opinion, the first thing our movement must do is acknowledge that we have failed. We failed to pass a transformational bill through the House, and if we employ the same strategy in the Senate, we will almost certainly see an insufficient, deeply flawed piece of legislation signed into law by President Obama. We must internalize failure, learn from our mistakes, and create a strategy for Senate engagement that changes the political landscape to line up with the science, instead of changing the bill to line up with the political landscape. Our movement has power. Young people elected Barack Obama. Our movement is growing in every state, in every congressional district, every county and town in America. It is time to flex that power. No more asking Congress what it can handle. We need to tell Congress what we demand, build a grassroots army that can threaten the seats of Senators who are in the way, and if we don’t get a strengthened ACES through, we need to replace the Senators (and Representatives) who are dooming us to a 2 degree Celsius plus increase in global temperatures, and a world that looks like the nastier parts of the bible – fire, flood and famine. Let’s regroup, let’s analyze what we did that worked and what didn’t, and let’s get this done in the Senate. Democratic Congressmen on ACES Climate Bill: "Doing nothing actually results in more renewable energy than approving ACES"
Representative Doggett (D-TX): "Doing nothing actually results in more renewable energy than approving ACES... Largest corporate welfare program in US history... I cannot support it." Rep. Doggett is citing analysis by the EPA, which found that ACES would reduce the amount of renewable energy deployed in the United States relative to business-as-usual, increase the amount of coal-fired electricity generation relative to 2005 levels, and provide no incentive for a move to cleaner cars. Representative DeFazio (D-OR): "Wall Street predicts this is the new trillion dollar market." Rep. DeFazio echoes a recent study by Friends of the Earth, which found that "the federal cap and trade proposals put forth so far would create a system that poses almost identical challenges as those in the mortgage-lending industry." The new funding for small LDCs is described in the summary of changes as follows: "The substitute amendment adds a new provision in section 782(a) to allocate 0.5% of allowances to small electricity local distribution companies for energy efficiency, renewable electricity and low income assistance programs. This allocation lasts from 2012 through 2025 and then phases out over the next five years." This funding appears to come at the expense of state funding for renewable energy deployment and energy efficiency, however, the LDC funding can only be loosely defined as funding for clean energy deployment given its potential use for low income assistance programs. The Waxman-Markey climate bill (AKA the American Clean Energy and Security Act) would reduce the amount of renewable energy deployed in the United States relative to business-as-usual, increase the amount of coal-fired electricity generation relative to 2005 levels, and provide no incentive for a move to cleaner cars, according to a new analysis by the U.S. Environmental Protection Agency (EPA). We certainly can't vouch for EPA's methodology or assumptions. However, with EPA's conclusions about the likely cost of the Waxman-Markey bill on U.S. Households and the broader economy being widely cited, the surprising and even counter-intuitive projections that underlie EPA's cost estimates are worth a close look. In this post we dig passed the EPA's executive summary to take a closer look at their modeling and projections. The climate bill is now poised for a vote on the floor of the U.S. House of Representatives as soon as Friday, following a deal struck late Wednesday between the bill's champion and Energy Committee Chairman Henry Waxman (D-CA) and Agriculture Committee Chairman Collin Peterson (D-MN). Waxman agreed to further concessions to secure the support of agricultural interests and their Congressional champions, including agreeing to strip EPA of primary oversight over the domestic carbon offsets market, giving the US Department of Agriculture jurisdiction over these programs instead, provide additional free allowances for rural electric co-operatives, and place a moratorium on new EPA rules to strengthen the environmental integrity of biofuels like corn ethanol. The EPA analysis of the latest incarnation of Waxman-Markey concludes that the bill will actually result in somewhat slower expansion of wind, solar, geothermal and other renewable energy power plants than under business-as-usual projections. EPA's modeling finds that under its business as usual scenario, electricity-generating capacity from renewable energy sources like wind, solar and geothermal would grow from 36 GW in 2005 to 40 GW in 2020 and to 43 GW in 2025. But under Waxman Markey legislation, renewable generating capacity would grow to 39 GW in 2020 and 41 GW in 2025. While EPA projects that the overall percentage share of renewable energy increases under Waxman-Markey [p. 3 and 26], there will actually be fewer new wind, solar and geothermal plants built if the bill passes than under BAU projections. The reason, says the EPA, is the low carbon price and reduced demand for electricity overall (driven predominately by the bill's energy efficiency titles, not the cap and trade program). "Under H.R. 2454, electricity demand is reduced significantly and allowance prices are not high enough to drive a significant amount of additional low- or zero- carbon energy (including nuclear, renewables, and CCS) in the shorter-term, excluding the technologies with specific financial incentives (e.g., CCS)," notes the Agency [p. 27]. This analysis is significant because the large-scale deployment of renewable technologies like solar power in Japan and Germany and wind power in Denmark was crucial for technological innovations that reduced the price of those technologies. While energy efficiency can modestly reduce emissions in the U.S., experts say clean, affordable, and scalable sources of power are needed to reduce global emissions 50 percent by 2050, which the IPCC recommends, while over the same period doubling or tripling energy consumption as poor countries develop. EPA projects a modest (3%) increase in total annual electricity generation from renewable sources in 2025, relative to BAU, despite the lower cumulative renewable energy capacity additions under Waxman-Markey. This is the result of "greater reliance on biomass co-firing at existing coal plants," the Agency explains [p. 26]. But while biomass fuels reduces carbon emissions it may also extend the profitable life of aging conventional coal-fired power plants. EPA projects a continued and robust role for coal-fired electricity generation under Waxman-Markey, with overall electricity from coal-fired power plants actually higher than 2005 levels through at least 2025. Electricity generation from conventional coal-fired power plants (without carbon capture and sequestration) will be slightly higher in 2015 under the Waxman-Markey bill than in 2005 and will remain roughly constant through 2020, according to EPA's projections. By 2025, conventional coal-fired power plants will be just a few percentage points lower than 2005 levels. After including EPA's projections for new coal plants with carbon capture and storage (CCS) technology, electricity generation from coal actually increases between 2005 and 2025 under the Waxman-Markey bill [p. 26]. The EPA also finds that the legislation would legally permit emissions in regulated sectors of the economy to remain above 2005 levels until sometime after 2025. This contrasts with the bill's stated objective to "[r]educe carbon emissions from major U.S. sources by 17% by 2020." EPA projects "the usage of international offsets [will] average over 1 billion tCO2e [tons of CO2-equivalent] each year" under the ACES cap and trade program [p. 3 and 36]. That's in addition to roughly 170-300 million tons of domestic offsets regulated firms are projected to purchase each year between 2012-2030, according to EPA's modeling [p. 34]. Excluding offsets, EPA concludes that actual emissions reductions in supposedly capped sectors of the U.S. economy will not fall below historic 2005 emissions levels until sometime after 2025 [p. 11]. If new baseload nuclear power and CCS-equipped coal plants are not technically feasible in the time-line projected by EPA, pressure will fall on baseload conventional coal plants to increase generation above the levels shown above, or for new coal-fired power plants to be constructed with a corresponding increased reliance on international offsets [p. 36]. Cumulative reliance on international offsets increases 15.5% if nuclear power is only available at BAU levels, according to EPA's sensitivity analysis [p. 36]. The expansion of CCS generation under Waxman-Markey is driven by the incentives provided for the technology in the form of bonus allowances from the emissions allowances under the cap and trade program (Title I, Subtitle B, Sec. 115 of the bill) and the bill's CCS early deployment program funded by a dedicated micro-carbon tax on all electricity sold in the United States (Title I, Subtitle B, Sec 114) [p. 27]. Without these direct deployment incentives, the carbon price generated by the bill's cap and trade program would not be sufficient to spur the major deployment of carbon capture and storage technology. EPA also found that Waxman Markey would have little to no effect on driving habits or technology innovation in the automotive sector. The carbon prices projected by EPA under Waxman-Markey ($13-16 per ton from 2015-2020) amount to an increase of just 13 to 16 cents per gallon. That price signal is unlikely to drive any significant shift in either consumer or business investment decisions, EPA concludes. Waxman-Markey will not drive the purchase of more few efficient vehicles or encourage less overall driving, EPA says. "The increase in gasoline prices that results from the carbon price ($0.13 in 2015, $0.25 in 2030, and $0.69 in 2050 under Scenario 2 - H.R. 2454) is not sufficient to substantially change consumer behavior in their vehicle miles traveled or vehicle purchases at the prices at which low GHG emitting automotive technologies can be produced" [Appendix p. 60]. Nor is the price signal going to provide incentive for auto manufacturers to invest in more fuel-efficient vehicles, let alone more technologically advanced plug-in hybrid or electric vehicles. As EPA writes, "The relatively modest indirect price signal on vehicle manufacturers from this particular cap-and-trade policy creates little incentive for the introduction of low-GHG automotive technology" [Appendix p. 60]. NPR's Morning Edition ran a segment today on the Breakthrough Institute, where I work as Director of Energy and Climate Policy. The segment featured our small think tank's work to re-frame global warming as an economic opportunity and advance a fundamental shift in policy capable of seizing that tremendous opportunity. You can listen to the NPR segment online here. If you're new to the Breakthrough Institute and want to get familiar with our work, please head here for a few recommendations of things to read. We love your comments, so please don't hesitate to opine. The Waxman-Markey climate bill (HR 2454) will not require emissions reductions below projected business as usual (BAU) growth in emissions for at least a decade ahead, according to an EPA analysis [pdf]. EPA projects that firms covered under the bill's cap and trade program will opt to purchase over one billion tons of offsets each year from 2012-2020 rather than reduce their own emissions. EPA predicts that firms would use 110 - 120 million metric tons (mmt) of available domestic offsets each year between 2012 and 2020 [see graphic, p. 6] and the full 1 billion mmt of international offsets permitted under the cap and trade program [p. 5]. If offsets are utilized at the levels projected by EPA, cumulative emissions in the sectors of the U.S. economy covered by the Waxman-Markey cap and trade program will be legally permitted to exceed EPA's business as usual emissions rates from 2012-2020 by nearly five billion mmt. If emissions in covered sectors were actually required to fall to the 17% below 2005 levels by 2020 targeted by the legislation, cumulative emissions would be just 49.5 billion mmt, 10.1 billion mmt lower than the levels legally permitted under EPA's projections for offsets utilization. However, the EPA analysis was of the early "discussion draft" version of the Waxman-Markey bill and was issued on April 20, 2009. The version of Waxman-Markey passed by the Energy and Commerce Committee (HR 2454) included several changes, including an increase in the permitted quantity of international offsets limit to 1.5 billion metric tons if supplies of domestic offsets fall below the billion tons of domestic offsets also permitted by the bill (see "Climate Bill Analysis, Part III: Waxman-Markey eliminates key offset provision, increasing domestic offset use, lowering allowance prices"). Total offsets would still be limited to 2 billion tons per year. This provision would very likely be triggered -- both EPA and CBO estimate that domestic offset supplies will fall well below 1 billion tons per year. EPA has not yet published an updated analysis of the version of Waxman-Markey now heading towards debate on the House floor. However, a brief EPA update [pdf] examines some of the ways the revisions from the discussion draft effect EPA's analysis of the bill. The memo notes that revisions to the bill would lead to an 11% increase in the use of domestic offsets and an unspecified increase in the use of international emissions offsets under the version of the Waxman-Markey bill passed by the Energy and Commerce Committee, relative to their analysis of the discussion draft version of the legislation [p. 2]. The graphics and analysis presented here include the 11% increase in domestic offset usage but does since EPA does not specify the increase in international offset usage, we continue to assume 1 billion tons of international offsets each year. This is therefore a conservative representation of the potential outcomes of Waxman-Markey under EPA's revised assumptions. See also: "CBO Projects Waxman-Markey Would Cut Cumulative Emissions by Just 2% Through 2020"
This April, the roots of leadership were laid in the Climate movement. From Powershift to the FTN Town Hall Campaign, young people across the country moved into positions of leadership, and engaged their community and policy makers on our vital clean energy future. A sea change in the quality and quantity of leadership occurred, and on the eve of the first ever US climate legislation it continues to breed success and momentum. Since April, certain needs have arisen that must be addressed. First, we must continue pressure on policy makers and institutions to accelerate our transition to clean energy sources, and to strengthen ACES and our local legislation. At the same time, we must fulfill the less noticed need of developing and empowering our new climate leaders. [Updated with correction, 6/18/09: Thanks to John Larson at WRI for alerting us to an error in our data. Our data is now corrected and impacted figures and conclusions have been bolded in the text below so readers can see what has changed. An updated spreadsheet has been uploaded. In summary: a smaller portion of economy-wide emissions were included in the emissions profile for sectors that fall under the cap starting in 2012 and a larger portion was included in the sectors that are phased into the cap starting in 2014. The result is slightly lower emissions under the ACES target scenario and CBO projected offsets scenario for the years 2012 and 2013 and slightly lower cumulative emissions between 2012-2020. The Waxman-Markey climate bill (HR 2454 or the American Clean Energy and Security Act) would reduce cumulative emissions by just 2% between 2012 and 2020 in the sectors of the U.S. economy regulated under the bill's cap and trade program, according to the Congressional Budget Office's analysis of the legislation. CBO, directed by Doug Elmendorf (pictured left), has published the first predictions from a government agency about the actual impact on U.S. emissions likely to result from the version of the Waxman-Markey legislation passed by the Energy and Commerce Committee and now heading towards debate on the House floor. CBO's analysis confirms earlier analysis by the Breakthrough Institute that revealed the climate legislation would only establish a non-binding emissions target, not a binding cap on emissions in covered sectors. Whereas Breakthrough's analysis examined the total emissions legally permitted under the legislation (without projecting likely scenarios), CBO's new analysis utilizes economic models to project what the legislation would actually accomplish under a likely set of assumptions. The reason CBO projects that Waxman-Markey will result in such a low and arguably immeasurable reduction in emissions in supposedly capped sectors of the U.S. economy is because their models predict most regulated firms will purchase emissions offsets rather than reduce their own emissions. The legislation legally permits regulated firms to purchase up to two billion tons of offsets each year in lieu of reducing their own emissions. CBO projects that firms regulated under Waxman-Markey's cap and trade program would utilize 230 million tons of domestic offsets and 190 million tons of international offsets in 2012 [p. 16]. By 2020, CBO projects firms will be utilizing 300 million tons of offsets from domestic sources and 425 million tons from international sources, for a total of 725 million tons of offsets [p. 16]. That's enough to offset 61% of the emissions reductions required by the ACES cap-and-trade program in 2020. However, CBO also projects firms will purchase more offsets and emissions allowances than they need to cover their emissions in the early years of the program [p. 15]. This is because emissions permits (allowances and offsets) can be banked indefinitely under the legislation, and CBO predicts firms will purchase relatively cheap permits at the outset of the program, banking them to allow greater emissions in future years. For this reason, only an examination of cumulative emissions permitted by the legislation tells the full story of emissions reductions actually driven by the Waxman-Markey bill. After taking into account the banking of emissions permits, Breakthrough's calculations [.xslx] reveal that if offsets are utilized at the levels projected by the CBO, Waxman-Markey will cut cumulative emissions in supposedly capped sectors of the economy by just 2% through 2020. CBO projects cumulative 2012-2020 emissions in capped sectors would be 54.5 billion metric tons, compared to cumulative emissions of 55.4 billion metric tons under the U.S. Environmental Protection Agency's business-as-usual emissions projections. If offsets are utilized at CBO's projected levels, cumulative emissions in capped sectors would be over 5 billion metric tons higher than if cumulative emissions were required to fall at the ACES target emissions trajectory (e.g. 17% below 2005 by 2020). For comparison, if the United States was on track to reduce emissions at levels consistent with IPCC recommendations for developed nations (e.g. at least 25% below 1990 levels by 2020 on a 450 ppm stabilization track), cumulative 2012-2020 emissions would be just 43.7 billion metric tons, 20% below cumulative emissions under CBO's projections for offsets. CBO predicts that cumulative economy-wide U.S. emissions between 2012 and 2020 would be reduced 5% under Waxman-Markey -- from 65.6 billion metric tons under the EPA's BAU baseline to 62.3 billion metric tons at CBO's projected offset levels. This analysis assumes that all domestic carbon offsets are emissions reductions that would not have occurred otherwise (i.e. 100% of domestic offsets are truly "additional"). It is worth noting that CBO's projections (like all forecasts) are based on various assumptions including the price of domestic emissions reductions, offsets, and the likely behavior of individual firms. The Waxman-Markey legislation itself does not legally require any emissions reductions below the EPA's projected emissions baseline through 2030, if offsets are available and purchased at the maximum levels permitted by the legislation. Update, 6/15/09: An astute reader noted that CBO projects that 2 billion tons of excess emissions permits from 2012-2019 [see p. 16]. These permits are not noted in the graphics above because they will be banked and "cashed in" in future years to increase the legally-permitted emissions. For that reason, they aren't truly equivalent to real emissions reductions driven in the period examined above (2012-2020), since these emissions reductions only come at the expense of increased emissions at some later date. However, there is something to be said for early emissions reductions, since the increased demand for early domestic emissions abatement opportunities may spur accelerated clean energy technology deployment and improvement. The following graphic therefore notes the impact of banked emissions permits on cumulative emissions from 2012-2020, based again on CBO's projections. Actual cumulative emissions in that period will be 52.5 billion metric tons, 5% lower than the 55.4 billion tons of cumulative emissions under the EPA's projected baseline. 2 billion tons of permits will be banked, allowing increased emissions in some future year after 2020. For comparison, cumulative emissions would be cut 11% below the EPA's baseline if emissions followed the Waxman-Markey bill's target emissions trajectory (i.e. an actual cut of 17% below 2005 levels by 2020). See also: "EPA Analysis Projects Waxman Markey Would Not Require Emissions Reductions Through 2020"
As Breakthrough's analysis of the Waxman-Markey American Clean Energy and Security Act (ACES) has revealed, the climate bill will effectively establish a non-binding "cap" on U.S. emissions while generating a pretty modest price for CO2 pollution. The implication: we can't count on the "cap" and trade provision alone -- nor the now ineffective renewable electricity standard -- to drive deep cuts in U.S. emissions or adequately accelerate clean energy deployment. To maximize the chances that the emissions reductions aimed for by the bill -- i.e. 17 percent below 2005 levels by 2020 -- are actually achieved, Congress must adopt a proactive set of policies and public investments to accelerate clean energy technology development and deployment and supplement the bill's weakened regulations and price signals. Several of the bill's provisions aim to do that, but we conclude that most are currently either completely unfunded or critically underfunded. Here we take a look at three smart provisions in the ACES bill that could be key components of a proactive clean energy technology strategy -- but only if they are adequately funded. Clean Energy Deployment Administration: this provision would establish a sort of public clean energy bank charged with creating an attractive investment environment for the widespread deployment of a suite of advanced clean energy technologies. Notable for being a deployment policy explicitly dedicated to advancing technology development goals, this provision also enjoys strong bipartisan support on both the House and Senate. However, ACES provides zero funding for this critical component of a proactive clean energy technology strategy. At least $16 billion in initial seed funding should be provided for CEDA, consistent with the Senate version of this provision. Energy Innovation Institutes: largely consistent with the recommendations of the Brookings Institution, Breakthrough Institute, Third Way and others, ACES establishes new "Clean Energy Innovation Centers" at research universities, national labs and private research facilities, creating new cross-sector and multi-disciplinary hubs for applied research and development on clean energy technologies. However, these energy innovation institutes are critically underfunded, receiving less than $1 billion/year in funding from the bill's cap and trade allowance value. To bring federal energy R&D programs to a scale sufficient to address the urgent energy innovation imperative and address the needs of a $1.5 trillion annual industry, at least $15 billion in new annual funding should be dedicated to energy R&D, with a significant portion of this new funding dedicated to establishing a robust nationwide network of energy innovation institutes. Carbon Capture and Sequestration Demonstration and Early Deployment Program: financed by a micro-carbon fee on all electricity sold in the United States, this program would dedicate $10 billion over the next ten years to promote the commercialization and large-scale demonstration of carbon capture and sequestration technologies for coal plants and other major point-source emitters of CO2. This program is a good example of the kind of direct public investment necessary to bring down capital and technology risk barriers and accelerate clean technology commercialization. But a much better-funded and technology neutral program that would provide competitively awarded funding for the demonstration of a whole suite of first-of-their-kind clean energy technologies is needed, and would be vastly superior to this technology-specific, industry-managed program. Clean Energy Deployment Administration: added as an amendment overwhelmingly adopted on a 51-6 bipartisan vote during markup, this provision establishes a sort of public clean energy bank to finance and accelerate clean energy technology commercialization and deployment. Sponsored by Representatives John Dingell of Michigan, Jay Inslee of Washington and Bart Gordon of Tennessee, the provision establishes a new Clean Energy Deployment Administration (CEDA) that will be responsible for creating an attractive investment environment that will spur the widespread deployment of advanced clean energy technologies, including higher risk "breakthrough technologies." The Administration would also support the widespread deployment of critical enabling infrastructure technologies (like new grid technologies), energy efficiency technologies and advanced clean energy manufacturing technologies. Intended to be a self-sustaining revolving fund, CEDA will leverage federal funds to provide direct loans, loan guarantees, letters of credit, insurance products and other credit enhancement mechanisms to support clean energy technology commercialization and deployment. Funds generated by the repayment of these loans and credit enhancement products will be returned to the CEDA fund to be redeployed. The new administration would be staffed by professionals experienced in project financing and technology commercialization and would manage a portfolio of projects with various levels of technology risk. This portfolio approach will allow CEDA to maximize the support provided for "breakthrough technologies" -- defined by the bill as clean energy technologies that have a high potential to advance American energy objectives but are not yet "considered a commercially ready technology due to high perceived technology risk or similar factors." In this way, CEDA is designed to provide the patient capital that can help emerging clean energy technologies bridge the infamous technology "Valley of Death" -- the window between R&D and commercialization that many potentially high-impact but high-risk technologies succumb to for lack of financing. Venture capitalists generally look to cash out their investments in 3-5 years, and many technologies struggle to prove themselves in this time frame without the kind of patient capital financing CEDA could provide. First, it was one of just two amendments passed during the marathon four-day Energy and Commerce Committee markup to receive broad bipartisan support from nearly the entire committee, again indicating the widespread support for clean technology development measures. Second, while the bill is dedicated to spurring the commercial deployment of clean energy, it explicitly views these activities as part of the broader technology development process and includes specific technology development and price improvement objectives in it's operating mission. Technology development doesn't stop at the edge of the lab, and it's high time Congress established a series of clean energy deployment and development policies that were designed as part of a proactive and coordinated portfolio of clean technology development policies aimed at supporting the entire clean energy technology pipeline. This CEDA provision is a smart step in the right direction. Unfortunately, the Waxman-Markey bill provides NO funding for this critical and potentially high-impact new Clean Energy Deployment Administration. Despite divvying up roughly $1 trillion in allowance value from the bill's cap and trade program between 2012 and 2025 alone (most of which is used to blunt the carbon prices' already modest impact on polluting industries and consumers), the ACES bill dedicates none of this revenue to seed CEDA's clean energy investment fund. Instead, the provision authorizes "such sums as are necessary" to be appropriated at some later date, effectively kicking this critical clean technology program into the tumultuous budget appropriations process to find funding somewhere else. In contrast, a Senate version of this provision included the energy bill now being marked up in the Energy and Natural Resources Committee, dedicates billions in funding to launch this new program. Like the ACES bill's CEDA amendment, the Senate's "21st Century Energy Technology Deployment Act" has strong bipartisan support and is sponsored by Democratic Senators Bingaman, Dorgan, Stabenow and Shaheen and Republicans Murkowski, Voinovich and Lugar. Most importantly, the Senate version dedicates $10 billion to set up the CEDA fund and specifies that the roughly $6.25 billion already appropriated for the Department of Energy's troubled loan guarantee programs will be managed by CEDA instead, providing $16.25 billion in start-up funding to kick-start the revolving financing program. CEDA would be able to leverage this initial funding considerably. Loan guarantees are regularly leveraged at 10 to 1 or more, meaning this level of initial funding would help spur private investment in clean energy technology projects worth more than $160 billion -- and that's before the fund revolves even once -- a clearly high-impact use of federal dollars. If Congress is serious about spurring clean technology development and strengthening the ACES bill, the Clean Energy Deployment Administration should receive at least $16 billion in starting funding, as in the Senate version of the legislation. CEDA could put this funding -- and probably much more -- to very effective use, driving the deployment of advanced clean energy technologies, strengthening American technological and economic competitiveness and helping achieve needed emissions reductions. Energy Innovation Institutes: one percent of the ACES bill's cap and trade allowances will be allocated to finance "Clean Energy Innovation Centers" at research universities, national labs and private research facilities, creating new cross-sector and multi-disciplinary hubs for applied research and development on clean energy technologies. These new energy innovation hubs are largely consistent with the new paradigm for federal energy innovation advocated by the Breakthrough Institute and Third Way in a forthcoming report due out this month and by Breakthrough and the Brookings Institution in a recent column at Yale e360. As we wrote with Brookings (who's Metropolitan Policy Project team has done yeoman's work developing this concept to date), in order to spur a clean energy technology revolution and make clean energy cheap, "federal and state governments, universities, and the private sector must join together to create a network of energy research institutes that could speed development of everything from advanced batteries to biofuels." However, as much as we are excited to see this new model for energy innovation included in the American Clean Energy and Security Act, we are equally disappointed by the level of funding provided for this critical clean energy R&D program. Overall federal clean energy R&D funding overall should be raised to $20 billion annually (from around $5 billion today) to bring it to the scale necessary to have a real impact on the $1.5 trillion U.S. energy and transportation industries and provide a level of funding comparable to other national innovation priorities (e.g. health and defense R&D) and historic innovation projects (e.g. inventing the atomic bomb and putting a man on the moon). A significant portion of this new funding would be necessary to establish a robust nationwide network of energy innovation institutes. In contrast, the ACES bill provides less than $1 billion annually in new funding for clean energy R&D leaving funding for both these new institutes and overall federal R&D budgets inadequate to the meet the energy innovation imperative we face. To adequately spur clean energy innovation and prime the clean technology pipeline, ACES should provide at least $15 billion annually in new clean energy R&D funding, with a sizable portion of this new funding dedicated to establishing new energy innovation institutes. Carbon Capture and Sequestration Demonstration and Early Deployment Program: added to the bill at the request of influential Energy and Commerce Committee member Representative Rick Boucher (D-VA), this provision dedicates $10 billion in funding over the next ten years to help spur the large-scale demonstration and commercialization of carbon capture and sequestration (CCS) technology for coal plants and other major point-source emitters of CO2. Funded by what is essentially a micro-carbon tax on all electricity consumed in the United States -- also known as a "wires fee" -- this provision would fund the establishment of a Carbon Storage Research Corporation that would be operated as a division of the electricity industry's Electric Power Research Institute. The Corporation would use this revenue to fund the large-scale demonstration of a variety of CCS capture and storage technologies in order to accelerate their commercial availability. Funded as it is by a dedicated fee assessed on American electricity consumers -- the fee will average about 50 cents per month for the average American -- and dedicated purely to CCS research, one would be forgiven for seeing this as a pretty sweet deal for coal-reliant utilities. At the same time though, it's a prime example of the kind of public investment and dedicated programs necessary to overcome the major capital barriers and high financial risk associated with the commercial demonstration of first-of-its kind energy technologies. The question really is: why is CCS the only technology to get this kind of deal? Why no program to spur the demonstration of advanced/engineered geothermal energy or deepwater floating offshore wind turbines? Why not up the carbon fee to $2.00 a month and provide $4 billion annually to fund a new Clean Energy Demonstration Agency that would invest directly in the commercial demonstration of a whole portfolio of emerging clean energy technologies; or use the funding to create a division within the Clean Energy Deployment Administration to directly finance these programs, expanding the tools CEDA can use to spur clean technology commercialization? The Carbon Capture and Sequestration Demonstration and Early Deployment Program is a good example of the kind of direct public investment necessary to bring down capital and technology risk barriers and accelerate clean technology commercialization. But a much better-funded and technology neutral program that would provide competitively awarded funding for the demonstration of a whole suite of first-of-their-kind clean energy technologies is needed, and would be vastly superior to this technology-specific, industry-managed program.